Lyra is a designer statement piece for relaxed meals. It’s perfect for al fresco dining. 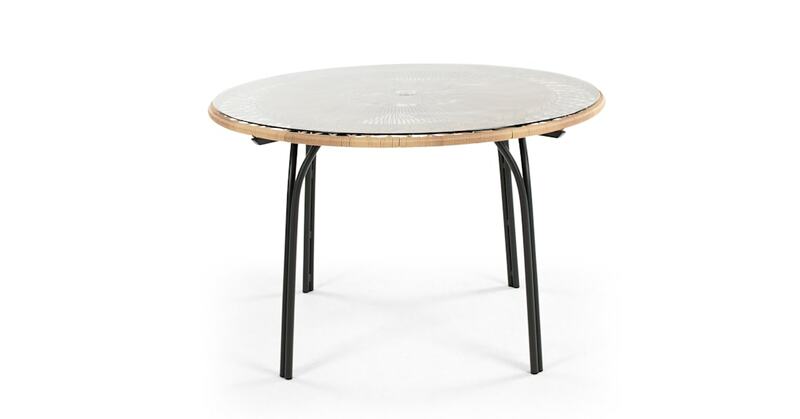 The glass table top shows off the retro-style woven poly rattan, which is durable enough to be left outside year round. On a sunny day, serve up fruit, pastries and fresh juice for an al fresco breakfast. Pick flowers from your garden for your table centrepiece, or put a parasol through the hole to create a shady spot. Hosting a barbeque? You can fit 6 comfortably around this table. Serve a fruity punch with lots of ice for a refreshing summer evening.